Robert-Goldwater-Library: "So What's Your Blog About?" The Robert Goldwater Library Online Resource (known in house as "the blog") is an interactive, online news and information resource. It is the brainchild of the Goldwater Library, the library to the Department of the Arts of Africa, Oceania, and the Americas of The Metropolitan Museum of Art. 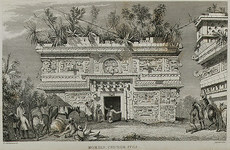 Like the library, its subject strengths include the art and material culture of West Africa, Papua New Guinea and Irian Jaya (Indonesia), and Precolumbian Mexico and Peru, with extensive holdings in related disciplines such as anthropology, ethnology, and archaeology. It also covers contemporary art in these regions, and issues broadly relating to libraries, museums, and online information resources. The blog aims to serve up a combination of timely news and scuttlebutt as well as pointers to online resources of lasting research value. As both authorship and readership expand, we expect that the blog will see an even wider variety of postings -- original reviews, think pieces, even audio and video feeds. The blog is the natural outgrowth of the library's longstanding tradition of providing reference services -- what we do each day in the library, simply 'repackaged' and 'repurposed' to make it available to a much wider potential audience. Then it's mostly about The Metropolitan Museum of Art? Not really. We certainly see the blog as an unequaled springboard for information about the collections & activities of Library, the department, and the museum. But the blog's content is meant to echo the scope of the library itself, as wide-ranging in geographical and topical coverage. Are there any other blogs like this one out there? 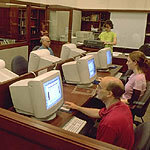 More and more libraries, typically public libraries, are creating blogs to serve their users. Museums have been much slower to respond to the untapped educational and promotional potential of blogs. So a library-generated blog coming out of a museum ... well, we like to think we're ahead of the curve on this one. By the same token, the core research areas for the library -- African, Native American, and Pacific Island culture -- are only slowly making inroads onto the 'information superhighway'. Right now most posts are written by the Goldwater Library staff. On several occasions we had asked scholars and librarians (or they've asked us) to write on a subject of value to the blog's readers. I know of an event (exhibition, publication, web site, &c.) that belongs on the blog. How do I get it there? (substituting an @ for the bracketed text). Or maybe just leave a comment? Please do. You're welcome to leave kudos or brickbats there. Click on the highlighted word Comments at the bottom of this or any post and follow the instructions. Can I subscribe to this blog's feed? There are any number of ways.